The Buffalo Wild Wings Satisfaction Survey, found at www.bwwlistens.com, is an online survey designed by Buffalo Wild Wings to measure how customers feel about the services and products they offer. It is an online survey, so take it at home when you have time. 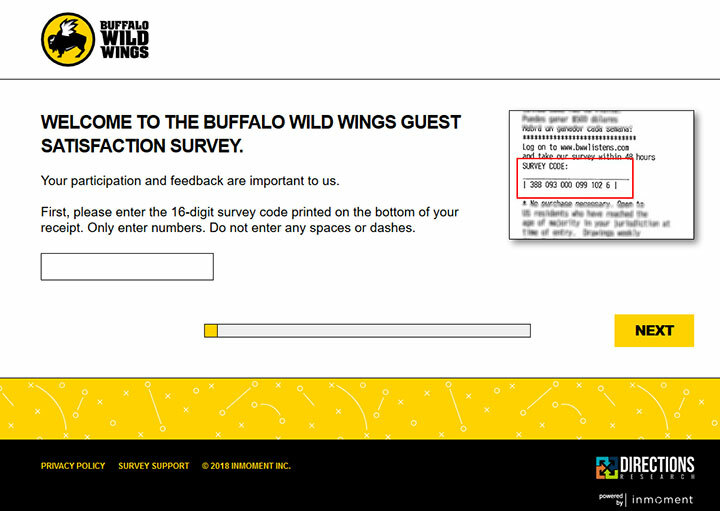 You must take this survey within 48 hours of visiting Buffalo Wild Wings, or the coupon and survey invitation are void. If you participate in the survey, you will be able to express any complaints or problems, as well as compliments about your most recent experience. As a reward, you will receive a coupon code for Buffalo Wild Wings, which you can use on your next visit to the restaurant. You are not obligated to use the coupon code in order to participate in the survey. Although Buffalo Wild Wings is best known for its wings and its many different seasonings and sauces, the fast food restaurant chain also offers a variety of other dishes. Customers can choose from salads, burgers and various appetizers, and the company also offers a range of carry out options. Buffalo Wild Wings was founded in 1982 by a trio of friends, and today the chain has almost 1100 locations in all 50 states, as well as several other countries. The chain has a sports bar atmosphere to it, and offers a selection of beer, as well as a constant program of live sporting events on its big screen televisions. Have your recent Buffalo Wild Wings receipt that contains an invitation for the survey. Read the rules and click Next. Enter the store number from the receipt, following directions above the text box. Click Next. Enter the last 20 digits from your check number. There are directions above the text box. Please follow these. Click next when finished. Answer the questions about your most recent experience. Answer honestly and make sure to answer all questions before moving on. When you are finished answering questions, you will receive a coupon code. Write this information down and follow all directions. Take this code with you on your next visit to Buffalo Wild Wings to receive a discount on your next purchase.